I had no idea how easy it was to get to Maine from Washington, DC! We left DCA and an hour and a half later (plus a 15 minute cab ride to the hotel) we were sipping amazing coffee and on our way to a gluttonous, romantic, fun weekend. When Maine in the dead of winter was proposed, this Floridian gave a side eye. But, a quick search of Portland's menus and it's simple to see how this walkable, waterfront downtown is one of the best "foodie" trips in the country. 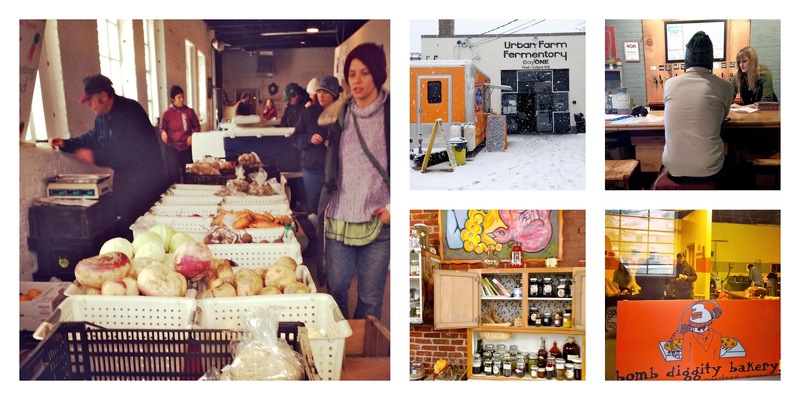 I insisted that we hit the Portland Winter Farmers Market, which was a bit of a hike, but doable. There's a coffee and crepes food truck out front, a kombucha bar in the back, an apocathary, a bakery and loads of vegetables, meats and dairy. Next up, we wandered two buildings down to visit Tandem Coffee Roasters, an adorable cafe and roastery where I immediately zoned in on a Chocolate Sea Salt Donut by Holy Donut and a latte. I'm still thinking about it. The barista was super cool and we struck up a conversation about how great the DC coffee scene is getting. It was fun that he knew about places like Chinatown Coffee and Dolcezza (which BTW is opening a gorgeous tasting room near Union Market in March 2014). With all of the eating ahead of us, we knew we needed to walk. a. lot. And, walk a lot we did. 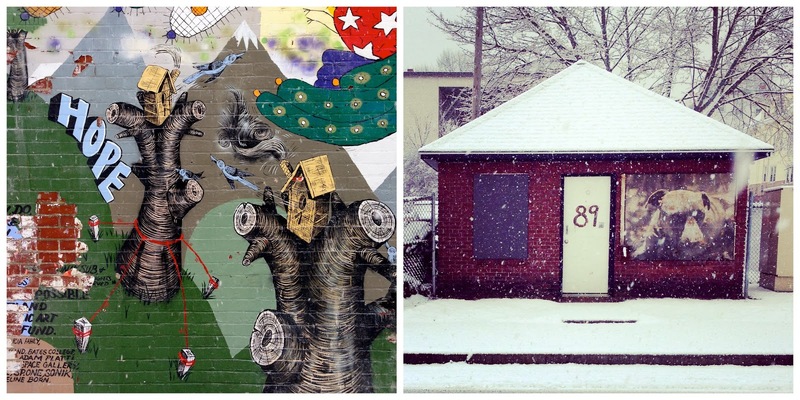 Portland's a great town to explore, particularly in a snowy winter wonderland. I loved the street art around town. I wanted to see the water. Which, I kind of could through the snow and fog. I loved this Christmas tree made of crab (or maybe lobster) traps. Our lunch target was the much-hailed DuckFat. The poutine was decadent - maybe because we doubled down on the fried eggs on top. We also sampled the pork belly panini and the duck confit panini. The meal and service was great, but I'll warn you, even in the dead of winter, this joint was jammed... and lousy with foodies. You know the type (points at self)... the ones in for the weekend that were oohing and ahhing and being all reverent of the meal and taking photos. Basically it was a bit like going to Paris and finding yourself surrounded by Americans at a cafe. 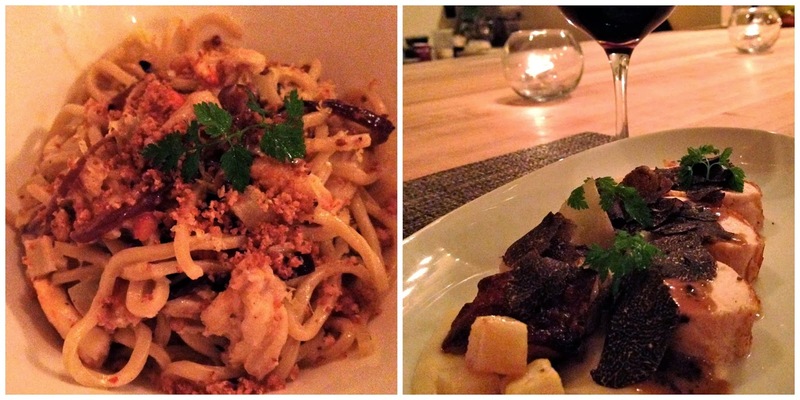 We had planned to go to dinner at Eventide, but after the foodie feeding frenzy at DuckFat, we wanted to go off the reservation a bit. (Spoiler: Lots more about Eventide to come...) As we were walking off lunch, we passed this tiny place called Piccolo that looked adorable and served Italian. We sort of looked at each other like, well we didn't come to Portland to eat Italian, but something about it felt right. So as soon as it opened, we called to get a reservation. I almost don't want to write about it lest it become taken over by people like me, but Piccolo was perfect. The tables were taken up by locals and we found seats at the chef's bar where the team helped us navigate the best bites on Chef Damian Sansonetti's menu. 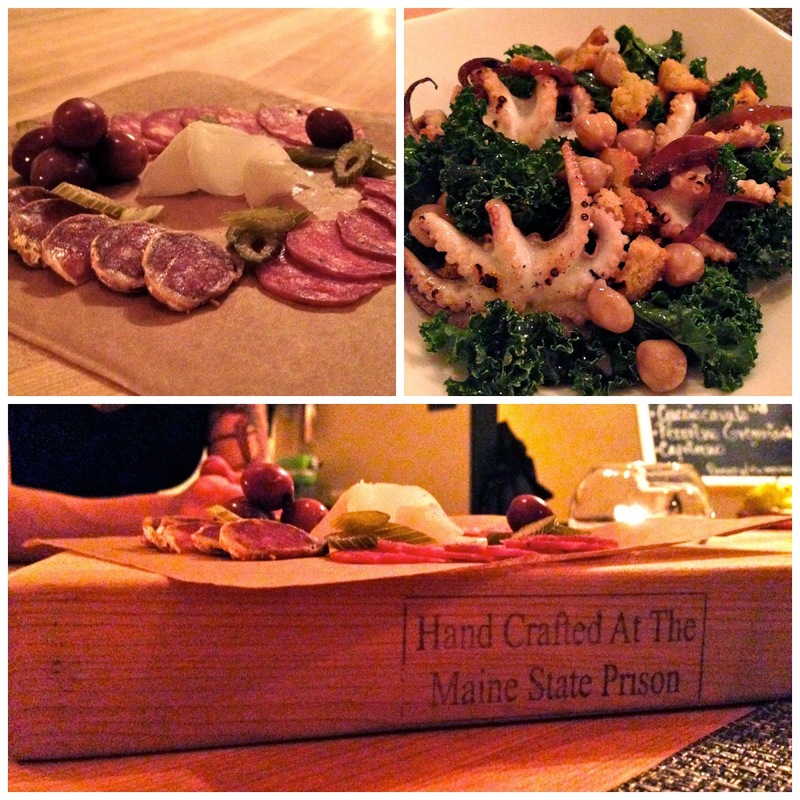 We started off with a salumi (please note that it was served on a board made by Maine state prisoners... clearly I must have one) and the pulpo, which was nestled in kale and chick peas. For dinner we shared the special of the day, a buttermilk-soaked chicken with truffles and the spaghetti with crab and chiles. Loved every minute of it. I'd like to say we collapsed after that, but our server at Piccolo recommended we check out The Portland Hunt & Alpine Club on the way back to the hotel. It's one of those joints with no sign. You look for the neon sign with the stars and your reward is classic and creative cocktails and great music in a cool but laid-back environment. I had a perfect Sazerac in a nod to my previous weekend trip to New Orleans. I either had enough layers or the cold in Portland is different than the cold we get in DC. It was constantly snowing, but it was fluffy and pretty, especially this park outside of Hunt & Alpine. 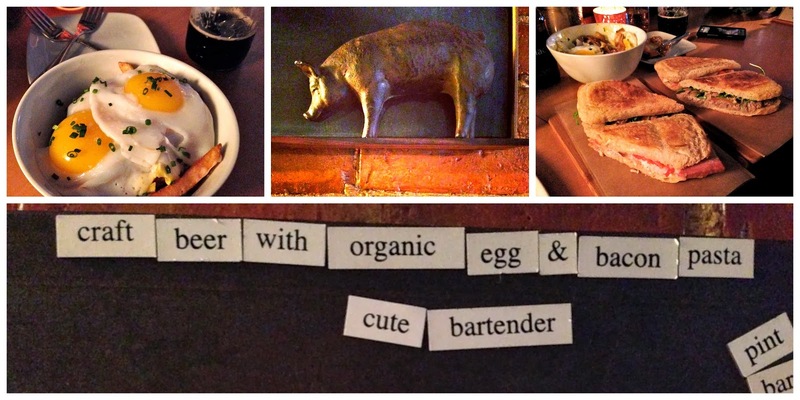 Can't wait to check out Portland Hunt & Alpine -- it was "coming soon" when I left in the fall! Great article & useful tips! You can also use this site => ttp://twitterunfollow.net. Here you can find people that don't follow you back. Super easy to use!